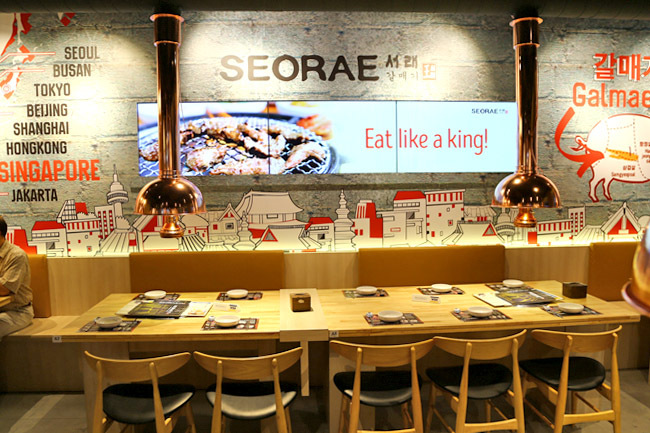 A few distinct features about Seorae at Plaza Singapura caught our attention – a special ‘circle grilling’ technique, accompanied with silky egg and fragrant garlic that can be cooked around the grill. 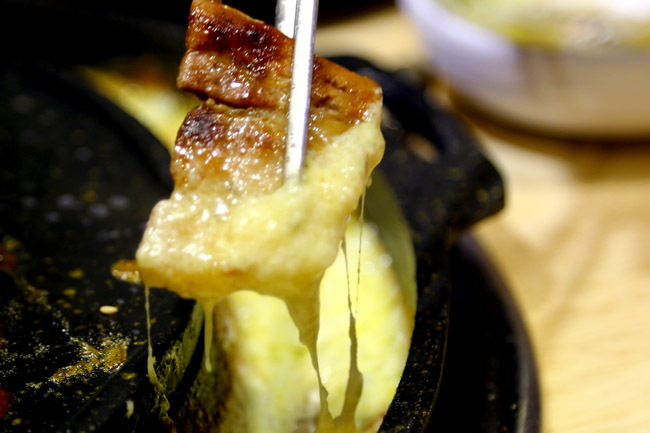 You can also top-up with melted cheese for more creaminess over the meats. 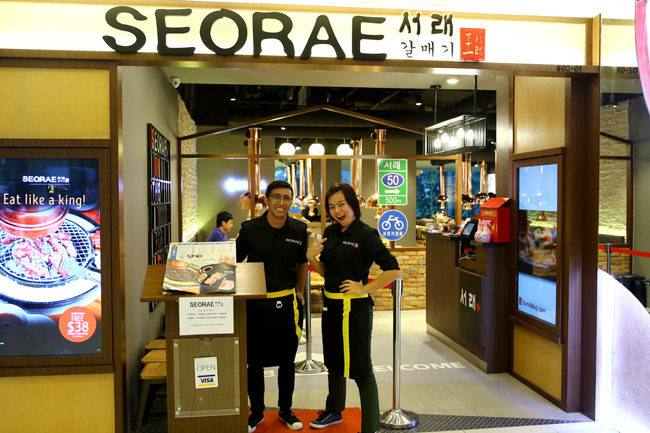 Seorae is a Korean charcoal BBQ franchise which signature is Korean galmaegisal, also known as pork skirt meat. 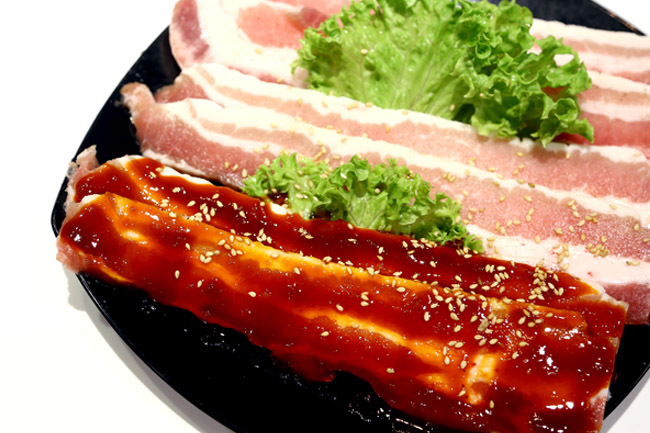 This meat is found between the ribs and the belly of the pig, a unique cut that forms only 250 grams of every full-grown pig, said to have been served exclusively to the Royal Family of Korea during ancient times. 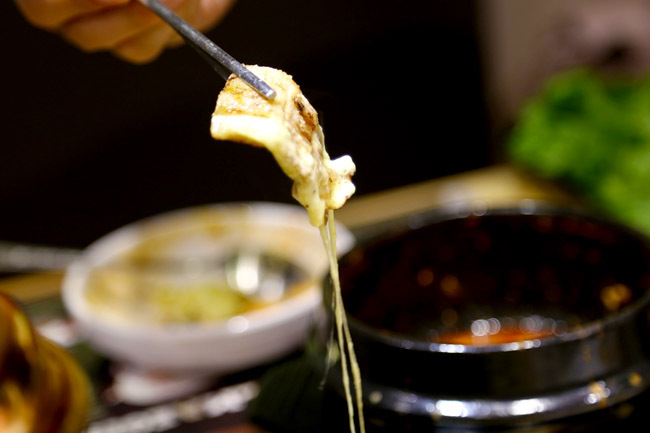 While most of the dishes we tried were decent, a few aspects here and there could potentially put customers off. So I would urge fellow diners to just have more patience. The slogan goes “Eat like a king!”, but the price point would suggest anything but that. A portion for the King Galmaegisal meat is at $29.90, So Galb short ribs $42.90, and La Balbi Beef ribs $38.90. Ordered the Three Musketeers plate which consisted of original, sweet and spicy pork belly which was at a more reasonable $31.90. 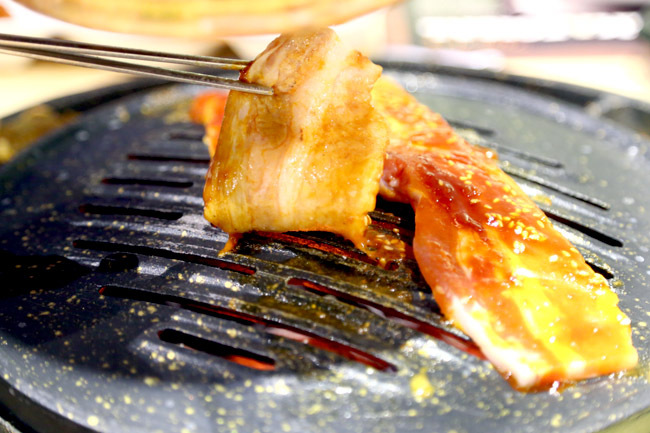 The meat was well-marinated and efficiently grilled for us. The cheese did up both the taste and guilt level. 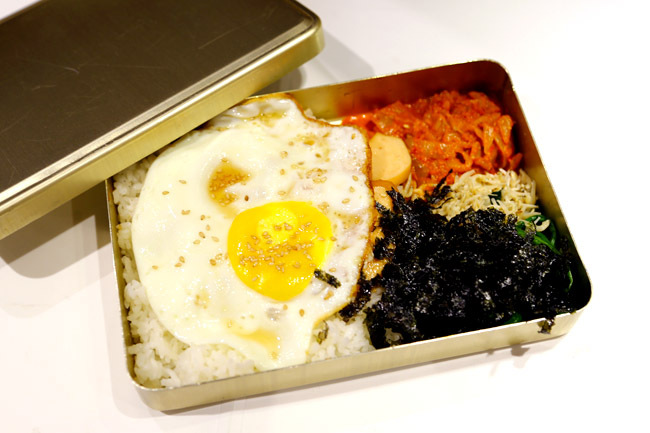 However, the Dosirak ($12.90) ordered came sans the seaweed, which we ‘own self’ add later. (We were fine with that.) BUT we noticed something amiss when the beef sausage reflected on the menu looked like and tasted like chicken. “Confirm beef,” The waiter said it with 100% conviction. Which was quickly retracted after we asked him to clarify with the kitchen. We were not angry, but amused actually with the reasoning. BUT can imagine that some other diners may not be that pleased at that retort. We were perplexed by the size of the bowl, clarified and were confirmed this was a LARGE portion. Fortunately, we were not that hungry. And this is one of the few Korean restaurants locally which do not serve jjigae dishes with a complimentary bowl of rice. 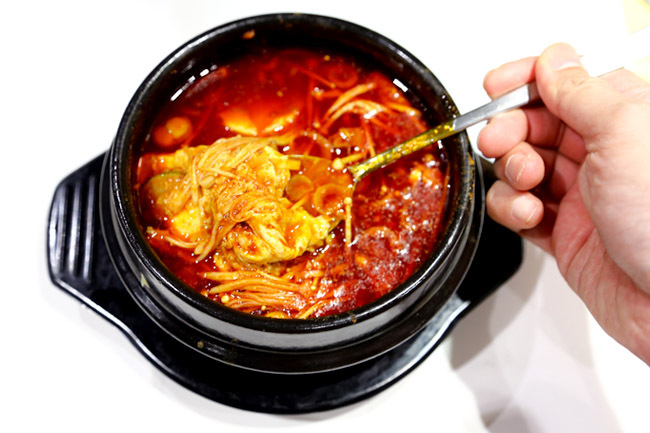 But to its credit, the soft tofu stew had quite a tasty base which should have a more-mass appeal. After the Bibim Patbingsoo ($12.90) didn’t arrive 20 minutes after we requested for it to be served, the reply was “You all must tell us to serve in the first place.” Oh-my-tian. 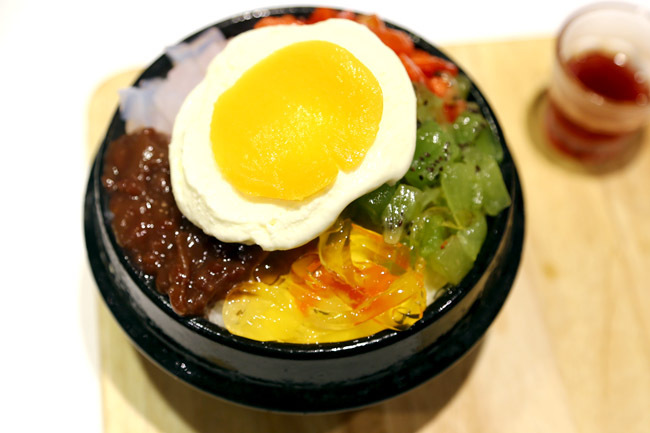 By the way, we liked most of the food here, but skip the bingsu unless they do something about the coarse ice. Which is a pity because the toppings and presentation was rather appealing. 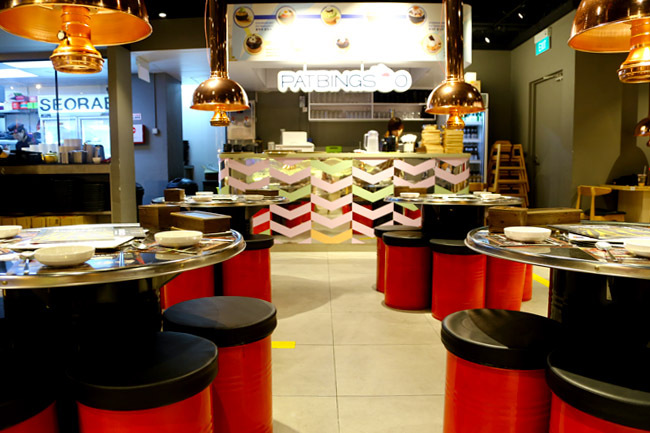 Actually most of the service staff who served us were earnest and looked like they were trying their best, but there was some apparent disorganisation the restaurant should sort out soon. 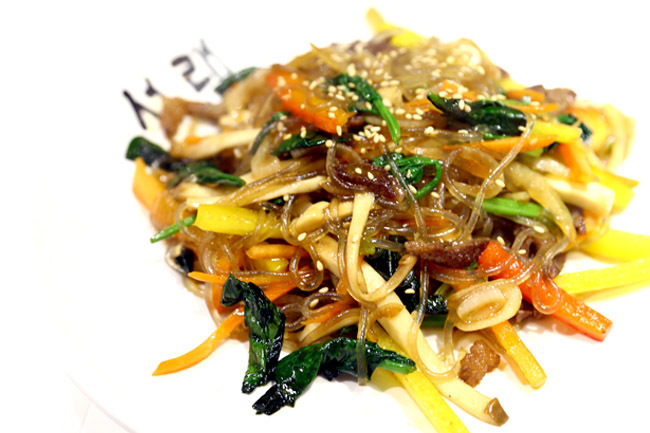 Good food overall at Seorae, that is if you can overlook the hiccups, forgotten orders and slightly steep price. I happen to be one of the employees in the picture and would appreciate it if the photo was taken down from the website as I have a certain situation which will leave me with certain unwanted inconveniences as result of my picture being featured on your website. I agree with you that their prices are steep. Went there last Sunday with family and i must say Seorae isn’t pocket-friendly. In my opinion, galmaegisal is just over-rated considering the fact that although there’s only 250g of it on each pig, it’s price (at the butcher’s or wet market) is not pricey and is even cheaper than many other cuts. I must say I’m impressed by their marketing technique which emphasises on galmaegisal’s rarity and thus suggesting it should be sold at an expensive price. Thanks for the piece of information. I obviously don’t go to the market often enough, thank you for sharing.